Our Weinklause-holiday-chalet is a "home within a home" and available for 5 to 6 people, all hotel benefits are included. It is located on the opposite side of the hotel in the house "Anna". Our unique holiday-chalet has about 140 sqm, with 2 floors, a ground floor with access to a terrace and a balcony on the 1st floor. The entire living-room area with a modern "openly" designed kitchen is separated by only a stairway entrance at the door. The kitchen is fully equipped. It has an oven and a dishwasher. 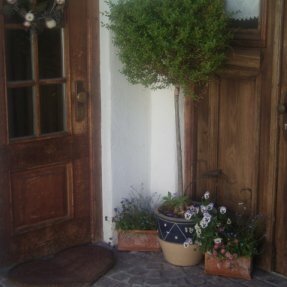 The dining room and the living room are on the ground floor and are beautifully decorated in the Allgäuer country style. We gladly offer our low-price half-board which includes a five-course meal. Of course children are very welcome, but because of the exceptional size of the chalet we can only put a discount on one child as the 6th person. Here you can send us a non-binding inquiry. Thank-you very much!